You can basically build a replica of you just find a ship you like and then look at the pictures very closely. I know that is not the answer you wanted, but great things arnt made with little work. What are you talking about??! I hope the annoying redcoats will be slain by the brave and "majestic" pirates. What music do you listen while MOCing? It varies, because I listen to pandora, but mostly green day, linkin park, 3 days grace, sum 41, kayne west (not sure if that is how you spell it) fort minor, eminem, apocalypta, and a lot of other great bands (including stone sour) that I am to lazy to name. ;P..........Mine is faster though, so I would never vrs yours though........;P Edit: that is to sebeus and the dread pirate Wesley! And to koltabeamer, sorry, I will take your advice into consideration but for now I am to lazy to rip apart my beautiful ship to do what you are describing. Wow, not my favorite time period of ships, but the level of detail is amazing! Nice job making it modular, too. Nice Moc, only thing I dislike is the flat rear baseplate used, even if it is old. Thanks for all your comments, sails will be made soon. There was no way around the lower rear gun looking squashed. Also the stern side windows don't meet the hull as nice as I wished. image by captaingoldenhook, on Flickr Oh, and sebeus, your Flying Dutchman does not have all the guns in the gun decks, so mine has more guns, it think. And the Flying Dutchman is defiantly not seaworthy. Welcome to eurobricks, I wish you a long and fruitfull moc'ing career here. Nice comic! And I am in it ;P How did you do it, photoshop or did you actually build my sigfig? I notice I don't have my dark green plume, so I am assuming the latter. 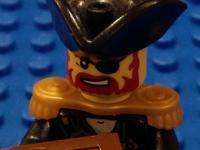 Nice Moc, I recognize the crane from the second lego adventure book with that pirate building guy. Thanks, ultimo :D Captain brawnsfeild the large tan ones name is eclipse, the large yellow ones name is vendetta, the small yellow ones name is Celeste, the one with the triple gun is dissector the maroon striped one is named maroon tiger, and the trading ship with the maroon broadside lines name is up for disscussion.